The Flexiride rubber torsion axle consist of three primary components: a rubber cartridge, support bushing and spindle arm. The cartridge is comprised of strong proprietary formula rubber bonded to a steel shaft. The bonding process used results in a bond strength exceeding the strength capabilities of the associated steel parts. Unlike the solutions used by competition, the system operates in shear rather than compression providing more angular compliance, a better damping effect and a smoother ride. The nylon support bushing maintains camber and contributes additional damping control. The spindle arm is a one piece forging with a splined joint connecting it to the cartridge. The splines, at six degree intervals, make an exceptionally strong connection while providing a range of starting angles. 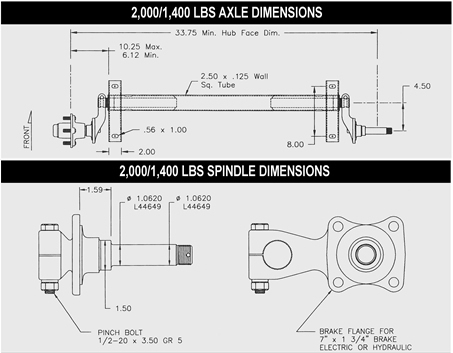 Components are available in four sizes: 2000, 3500, 5200, and 7000 lbs axle capacities. Durability: The cartridge construction offers superior resistance to abrasive road elements, increasing the life and durability of the axle. 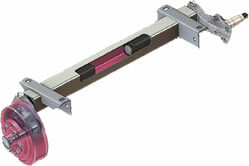 Because the cartridge is press fit inside the axle tube, it forms a water ltight seal, thus allowing the axle immersion without having the tube inside exposed to corrosion. Smoother ride and longer life: The high quality proprietary formula rubber guarantees a smoother ride and longer life. The independent suspension allows each wheel to travel totally independent from the others. A smoother ride, less sway and reduced noise is achieved with the rubber suspension. Progressive Torque: It increases carrying capacity as the lad is applied, allowing smooth ride even with an unloaded trailer. Safer and stronger: The specially engineered one piece forged spindle arm creates a system which is safer and stronger than any welded unit. The axle tube acts like an extra cross memeber, adding strength and preventing frame twisting. The rubber cartridge is completely encapsulated inside the axle tube, so there are no pinch points. Adjustable: The splined arm is adjustable for a range of starting angles to suit special applications. The axle can be built with various start angels to achieve desired trailer height. Damping Control: Because of the rubber natural vibrations absorbing capabilities, no shock absorbers are required. Easy replacement: Unlike welded systems the Flexiride® spindle arm can be removed easily for repair or replacement. Quick installation: The axle assembly requires only four bolts to mount reducing installation time. Built-to-suit axle system reduces lead times and inventory. Warranty: UCF offers a five year warranty on components, that demonstrates how confident they are with the Flexiride suspension. 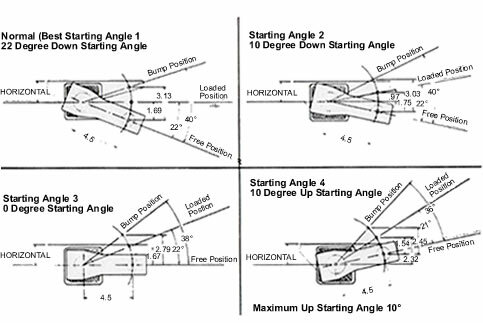 The normal 22 degree starting angle maximizes the Flexiride® performance advantage, however, other starting angles are possible for special applications. This build-to-suit system eliminates the need for large inventories of different axle configurations and reduces lead times considerably. 2,000 lb. Flexiride Torsion Axle with Hubs. Superior ride, ultra lube spindles with rubber plug caps, standard steel (are not coated), adjustable spindle arms, and replaceable spindle arms. This axle is custom built to your outside frame width at our Lubbock facility. 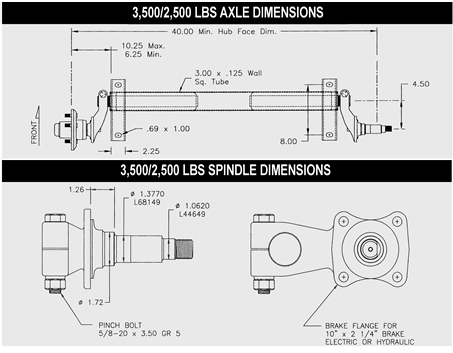 Flexiride Torsion Axles are non-returnable and cannot be galvanized or use any heat based coating. Assembly generally takes 7-10 working days (this does not include the weekends). If you have any special requirements please call and order at 1-800-866-3339. 2,000 lb. Kodiak Hydraulic Disc Brake Axle that will accept 10" wheels and tires. Perfect for pontoon boat, snowmobile, and smaller camper trailers. A sophisticated axle with premium stopping power. Only available with a 5-4.5" hub pattern. This axle is custom built to your outside frame width at our Lubbock facility. Flexiride Torsion Axles are non-returnable and cannot be galvanized or use any heat based coating. 3,500 lb. Flexiride Torsion Axle with Hubs. Superior ride, ultra lube spindles with rubber plug caps, standard steel (are not coated), adjustable spindle arms, and replaceable spindle arms. This axle is custom built to your outside frame width at our Lubbock facility. Flexiride Torsion Axles are non-returnable and cannot be galvanized or use any heat based coating. Assembly generally takes 7-10 working days (this does not include the weekends). If you have any special requirements please call and order at 1-800-866-3339. 3,500 lb. Flexiride Torsion Axle with Kodiak Hydraulic Disc Brakes. Superior ride, ultra lube spindles with rubber plug caps, standard steel (are not coated), adjustable spindle arms, and replaceable spindle arms. Disc brakes are Kodiak and are offered in three different finishes dacroment plated hub/rotor, caliper and mounting bracket, dacroment plated hub/rotor, stainless steel caliper and silver cadmium mounting bracket, or Galvanized hub, stainless steel vented rotor, stainless steel caliper and stainless steel mounting bracket. Lubrication is available in grease or Kodiak Oil Bath Lube. This axle is custom built to your outside frame width at our Lubbock facility. Flexiride Torsion Axles are non-returnable and cannot be galvanized or use any heat based coating. LTL, ground, or express freight options will require some assembly (must box pieces of the disc brakes to protect during shipment). Assembly generally takes 7-10 working days (this does not include the weekends). If you have any special requirements please call and order at 1-800-866-3339. 5,200 lb. Flexiride Torsion Axle with Hubs. Superior ride, ultra lube spindles with rubber plug caps, standard steel (are not coated), adjustable spindle arms, and replaceable spindle arms. This axle is custom built to your outside frame width at our Lubbock facility. Flexiride Torsion Axles are non-returnable and cannot be galvanized or use any heat based coating. Assembly generally takes 7-10 working days (this does not include the weekends). If you have any special requirements please call and order at 1-800-866-3339. 5,200 lb. Flexiride Torsion Axle with Electric Brakes. Drum brakes are available in 12 x 2" electric drum, self-adjusting electric drum, or hydraulic drum. Superior ride, ultra lube spindles with rubber plug caps, standard steel (are not coated), adjustable spindle arms, and replaceable spindle arms. This axle is custom built to your outside frame width at our Lubbock facility. Flexiride Torsion Axles are non-returnable and cannot be galvanized or use any heat based coating. LTL axles will come fully assembled, ground or express freight options may require some assembly. Assembly generally takes 7-10 working days (this does not include the weekends). If you have any special requirements please call and order at 1-800-866-3339. 5,200 lb. Flexiride Torsion Axle with Kodiak Hydraulic Disc Brakes. Superior ride, ultra lube spindles with rubber plug caps, standard steel (are not coated), adjustable spindle arms, and replaceable spindle arms. Disc brakes are Kodiak and are offered in three different finishes dacroment plated hub/rotor, caliper and mounting bracket, dacroment plated hub/rotor, stainless steel caliper and silver cadmium mounting bracket, or Galvanized hub, stainless steel vented rotor, stainless steel caliper and stainless steel mounting bracket. This axle is custom built to your outside frame width at our Lubbock facility. Flexiride Torsion Axles are non-returnable and cannot be galvanized or use any heat based coating. LTL, ground, or express freight options will require some assembly (must box pieces of the disc brakes to protect during shipment). Assembly generally takes 7-10 working days (this does not include the weekends). If you have any special requirements please call and order at 1-800-866-3339. 7,000 lb. Flexiride Torsion Axle with Hubs. Superior ride, ultra lube spindles with rubber plug caps, standard steel (are not coated), adjustable spindle arms, and replaceable spindle arms. This axle is custom built to your outside frame width at our Lubbock facility. 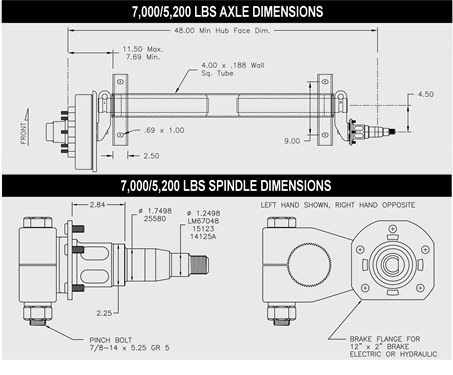 Flexiride Torsion Axles are non-returnable and cannot be galvanized or use any heat based coating. Assembly generally takes 7-10 working days (this does not include the weekends). If you have any special requirements please call and order at 1-800-866-3339. 7,000 lb. Flexiride Torsion Axle with Electric Drum Brakes. Hub/drums are available in standard stud pilot 8-6.5" with 1/2" studs and conical nuts for standard 16" stud pilot wheels or hub pilot 8-6.5" with 9/16" studs and swiveling flange nuts with 4.75" center bore for 17.5" hub pilot wheels (steel wheel 17240-52 or Alcoa aluminum wheel 661401). Drum brakes are available in 12" x 2" electric drum, self-adjusting electric drum, or hydraulic drum. Superior ride, ultra lube spindles with rubber plug caps, standard steel (are not coated), adjustable spindle arms, and replaceable spindle arms. This axle is custom built to your outside frame width at our Lubbock facility. Flexiride Torsion Axles are non-returnable and cannot be galvanized or use any heat based coating. LTL axles will come fully assembled, ground or express freight options may require some assembly. Assembly generally takes 7-10 working days (this does not include the weekends). If you have any special requirements please call and order at 1-800-866-3339. 7,000 lb. Flexiride Torsion Axle with Kodiak Hydraulic Disc Brakes. Superior ride, ultra lube spindles with rubber plug caps, standard steel (are not coated), adjustable spindle arms, and replaceable spindle arms. Disc brakes are Kodiak and are offered in three different finishes e-coat hub/rotor, caliper, and mounting bracket, dacroment plated hub/rotor, caliper and mounting bracket, or dacroment plated hub/rotor, stainless steel caliper and silver cadmium mounting bracket. This axle is custom built to your outside frame width at our Lubbock facility. Flexiride Torsion Axles are non-returnable and cannot be galvanized or use any heat based coating. LTL, ground, or express freight options will require some assembly (must box pieces of the disc brakes to protect during shipment). Assembly generally takes 7-10 working days (this does not include the weekends). If you have any special requirements please call and order at 1-800-866-3339.